We are half way to Halloween and I thought now would be a good time to bring in one more pumpkin craft. For this craft, I am bringing in a guest from the Halloween Alliance. I hope you enjoy! For a beautiful, rustic looking Halloween display or Fall centerpiece, you can easily create these glittery Halloween pumpkins in no time. They are inexpensive, and though they look sophisticated, they wouldn’t look out of place in a cabin or in the backyard. That’s probably because they remind me of over-sized potpourri. I will likely make some more in metallic greens and reds as part of this year’s Halloween decorations. There are so many combinations of paint colors and glitter, the possibilities are endless. Experiment and mix and match to create the perfect glittery pumpkins to fit your Halloween or Fall decor. 1. Clean pumpkins with a damp cloth. Dry completely. 2. In a well ventilated area, lightly spray the bottom halves of all pumpkins and allow to dry. 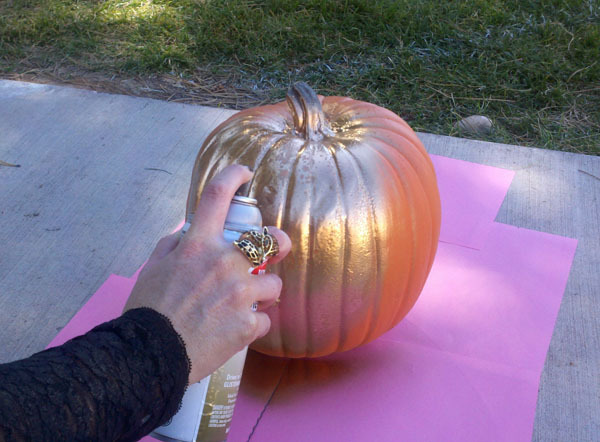 Make sure to use a light coat of spray paint so the paint doesn’t drip down the pumpkin. 3. After the pumpkin bottoms have dried, lightly spray the tops of the pumpkins, including the stems. 4. Repeat steps two and three until you have the color you want on your pumpkin. It usually takes about three coats. Metallic paint usually dries completely in 15 minutes if you do light coats so this process doesn’t take a terribly long time. 5. 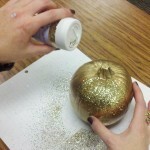 When the pumpkins have completely dried, you can add glitter to some or all of them. 6. 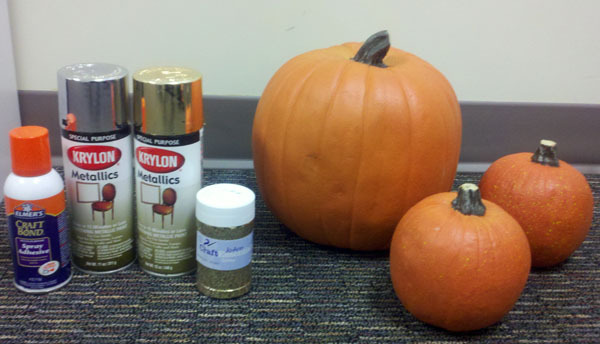 For glittery pumpkins, work with one pumpkin at a time. Spray the adhesive on the pumpkin in one inch strips from top to bottom. Immediately add the glitter to the strip while the adhesive is still tacky. 7. 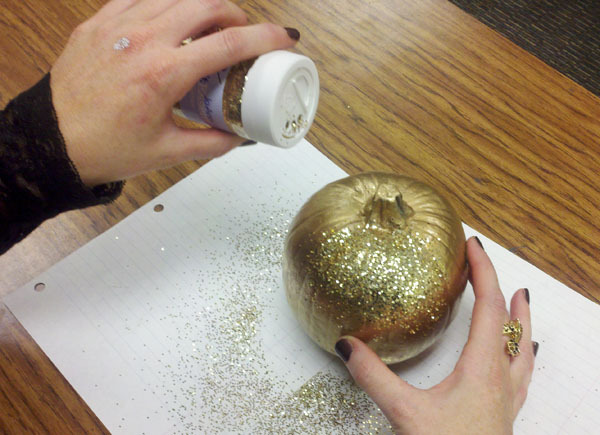 Continue to spray adhesive and glitter in strips, holding pumpkin by the stem and turning until the pumpkin is completely covered. Cover the stem in glitter last. 8. 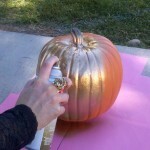 Allow adhesive and glitter to completely dry before touching the pumpkins. Thank you Chris Molnar @ Halloween Alliance for this chic pumpkin craft!